12th-15th centuries. A new north aisle was added 1898-1900 and vestries 1959-60. 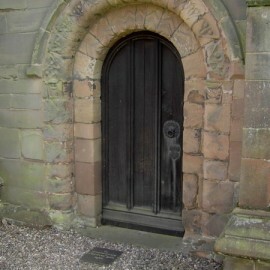 The earliest part of the building is the Norman north doorway c1170 which was re-set in the new north aisle wall, along with the three original medieval nave windows. The round arch has zig zag and “beak head” patterns typical of its date. 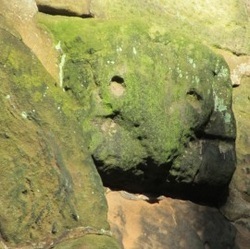 There are also two pairs of 12th century carved heads on the lower stage of the tower, probably reset when the Norman chancel and tower were rebuilt c 1230 in the Early English style, characterised by the lancet windows. The south aisle and nave were rebuilt in the early 14th century, as the windows with the characteristic “Y tracery” of the English Decorated period indicate. The arcade between the nave and aisle appears to have become unsafe and was rebuilt later that century, along with additional buttresses for the south wall. The upper stage of the tower and the porch were added in the late 14th or early 15th centuries. ​Unusually there is no stone Chancel arch. Instead four separate but contiguous roof trusses act as an arch. Above, a rare medieval tympanum is still in place, resting on a tie beam, with the frame showing grooves for wattle and daub in fill. When the plasterwork was removed in 1955 it revealed traces of a “Doom” painting, probably Judgement Day, on the boards behind. The traditional figures of the rood, the crucified Christ, the Virgin Mary and St John in medieval style were placed here in 1956.